You too can be a hike leader! Do you have favorite hikes you like to show your friends or are you a person who likes to try new trails? You may want to consider becoming a hike leader. GLS is made up of volunteers - people like you, volunteering to lead hikes and other outings. To become a hike leader follow these three easy steps. 1. Co-lead two hikes. 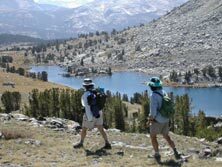 You must co-lead two hikes with a hike leader who is GLS approved. You must be the primary organizer of one of the hikes. 2. First Aid. Each GLS hike leader must maintain first aid certification. This is required for us to have coverage under Sierra Club's insurance. GLS will reimburse the cost of a first aid course up to $50. 3. Do the Sierra Club online Outings Leader Basic Training 101. 4. When you have completed the above requirements, fill out the hike leader application and email it to the Outings Chair. A hike leader application can be downloaded here. So act today. Get out there and lead those hikes, tie those practice slings, and become part of the great cadre of GLS hike leaders.